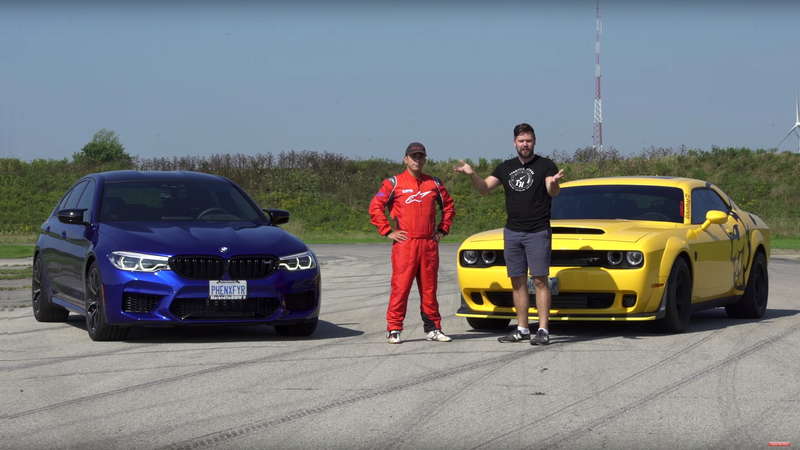 I never thought that I would ever compare the 2019 BMW M5 Competition to a Dodge Demon, as they are so philosophically different, but watching them compete with each other is no less fun. The M5 embodies sophisticated European luxury performance. It has all-wheel drive and rear-wheel drive. It has a complicated twin-turbo V8 and it’s meant to be a family sedan. The Dodge Challenger SRT Demon is meant to be a dragster. It uses a supercharged V8, runs around on drag tires, rides on a super old chassis and is called a freaking Demon. Does anyone actually cross shop these two? The folks over at Throttle House uploaded a video today of a shootout between the two cars. They tested them through feats of drag racing, drifting and good old lap times. The results are what you’d expect. The M5, with its all-wheel drive beats the Demon in a straight-line drag race. And though the Demon is a wonderfully linear drifter, it’s way slower than the BMW when setting a lap. However! Both presenters said that they would prefer to take the Demon home, simply because it’s more fun and has a much more tangible personality. I totally get it, too. The M5, despite being great at everything it sets out to do, doesn’t have much of a soul to it. And soul isn’t what wins drag races or sets incredible laps. It’s what makes you laugh when you drive the car.